At 8:17 PM TONIGHT!!! What is it? 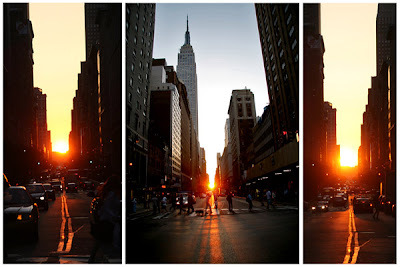 "For 15 minutes around sunset on two days this summer, the sun will set in exact alignment with the cross streets of Manhattan's street grid, making the city's towering buildings function something like a modern-day Stonehenge. MANATTAN IS AWESOME! I WANT TO LIVE THERE! Beautiful! Thank you so much; those pictures are incredible. Cool! Does this happen every year? Too bad I am not going to be in NY then :( .I wish I was! i know this is completely off topic and random, but i gotta know. have u seen the policeman who pulled a bus with his HAIR??????!!!!!!!! if not, u gotta see it!!!! it's insane!!!! its on msn video!!! the dude practices by uprooting a tree every morning! his goal is to try to pull a PLANE with is hair next!!!! P.S. BTW at the same place as the bus pulling hair guy, u can watch the world burping champion try to beat his record of 118 decibles (as loud as a clap of thunder) and u can witness a dude lift 1,100 pounds! I was so relieved when I read that it was biannual...I thought it was like that thing where the moon is really bright every five years or something. Thumb Biter: Here's an article for you . . .
Oh yeah! I remember that article. Also, whoops...I must have accidentally changed my name... :P this is Jin Ai. Oh good! I was hoping you hadn't disappeared. There are more articles at the NY Times. Just put "hidden houses" into their search box. hey kristen i am having a problem. my ipod touch is on wi-fi and i can get on yahoo etc, but i can't open your site up! it will come up, but only as a black page with two cubes that have question mars! i was really hoping to see your site on my touch.. *sigh*...kool pics i really like them! them made me smile! I am a HUGE fan of your books and i was wondering. When is the next book coming out? what is the title called? Are you finished with it yet? sry for so much questions. I was wondering if you could either email me or give me your address so i could give you a letter. please please PLEASE! reply back. Amber: My email is kikistrike@gmail.com. anybody know what a prepositional phrase is? for some stupid english project we're "traveling" to somewhere and have to do the most evil and impossible stuff!!! i hate english, especially the teacher. Coooooooooooool!!!!!! Those photos so nice! I am a HUGE fan of your books and i was wondering. When is the next book coming out? what is the title called?But I really want you to make another sooo please do! You know I go to Manhattan every week so this is kind of boring.